Welcome to the first edition of my new series, "Absolute Fretboard Mastery." What is absolute mastery? Well, one thing that I’ve noticed throughout my years as a guitar teacher is that a lot of players tend to go around in circles in terms of the knowledge that they acquire. They sometimes tend to learn various theories and techniques and end up forgetting them over time, which in turn means they have to spend time relearning these things over and over again. And getting stuck in this sort of run-around process means they never make full use of the time they spend with the instrument. Some of the ideas and ideas I write about might seem very basic, and they might be things you already know. But by the end of this series, they should all come together to give you absolute understanding and mastery of your fretboard. And by that point, you will eliminate any sort of doubt or hesitation that you may have when navigating your instrument. Take scales, for instance. Sometimes when guitarists learn to play scales, they tend to do so in a very one-dimensional way. I refer to as this learning with blindfolds on. For example, if a player were to play a scale in one position and were to try and move up the fretboard, without absolute mastery of the fretboard they’d only be able to move up and simply play that second position. 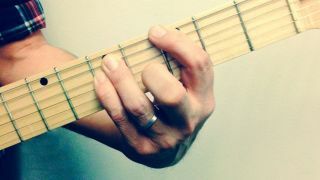 But by achieving absolute fretboard mastery, you will be able to connect these positions together, and ultimately view and connect the entire fretboard as one cohesive whole. In today’s lesson, I’d like to start off by introducing you to the five minor and major pentatonic shapes and help you master these positions. What I want you to do first is start with the first position of the A minor pentatonic, starting on the fifth fret, and play it up and down using down strokes and alternate picking. And remember, the goal here isn’t just to play this position up and down, but to absolutely memorize and master it. Next, what I want you to do is move up the fretboard to the second position of the A minor pentatonic and do the same. If you play close attention to what you’re playing, you’ll notice that you’re playing the same notes as you did in the first position. And you’ll also start to see that the second position of the A minor pentatonic scale fits in like a puzzle piece with the first position. Next, what I want you to do is start playing these same notes across all five positions. So you’ll have your first position starting on the fifth fret, second position on the eighth fret, third position on the 10th fret and the fourth position on the 12th fret. And when you come to the fifth position on the 15th fret, you’ll see that you can play the same position, an octave lower, on the third fret. What I want you to do this month is to memorize these five positions on the fretboard in the key of A minor. And if you find it hard to memorize all five positions, focus on the fifth position starting on the third fret, the first position starting on the fifth fret and the second position starting on the eighth fret. This way you’ll have a big block across the fretboard that you can play within. Once you familiarize yourself with these positions you’ll start to visually see how each position is linked across the fretboard and that really is the goal of this exercise. Once you’ve mastered these five positions in the key of A minor, the next thing I want you to do this month is to memorize the five positions of the A major pentatonic scale. When you do this, you’ll notice again how the positions entwine with one another. The third exercise I want you to do this month is to memorize the notes on the sixth string. Now at first this can seem quite intimidating, so here’s a little short cut: What I want you to do is first memorize the notes on the odd-numbered frets. So if you’re open string is an E, your first fret is an F, the third is a G, the fifth is an A and the sevnth is a B. You also can use your fretboard markers to memorize these notes because there are markers on the third, fifth and seventh frets. And next on the eighth and 10th frets you have a C and a D. And then once you reach your 12th fret, which is an E, the notes repeat all over again. Once you have the notes memorized in this way, locating the flats and sharps won’t be a problem. To play a flat note all you have to do is move one semitone (one fret) lower and one semitone upwards for a sharp note. The reasons that I advise beginners against learning the notes on the fretboard all at once including the sharps and flats is that sometimes it can get overwhelming and students tend to start counting to locate notes. But by approaching the task of learning the notes this way, we’re able to learn them with absolute certainty without needing to count them. The next exercise that I want you to work on this month involves a technique that I call "meandering." This is the phrasing section of this series. And basically what I want you to do here is to see how long you can move around your fretboard in a certain key (A minor pentatonic, for instance) without stopping. But remember, this is not supposed to be a musical exercise, so you don’t have to worry about sounding musical. The point is to see how well your brain and your hands can navigate your fretboard without getting stuck. So all you need to worry about is to keep playing while using as much of the fretboard as possible. The third category of exercise, which is the technical aspect of this series, is meandering to a metronome while steadily increasing your tempo. So once you’re able to "meander" steadily at a tempo of 120 bpm, you can knock it up gradually. Or you can do the same to a simple jam track. And while you’re doing this, keep in mind that the point isn’t to play fast or musically, but to utilize as much of the fretboard while playing constantly. While these first few exercises might seem incredibly basic, they really are some of the cornerstones of great guitar playing. So I hope you practice hard, and I look forward to our next lesson.